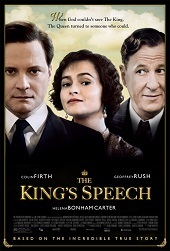 Starring: Colin Firth, Geoffrey Rush, Helena Bonham Carter, Michael Gambon, Guy Pearce and Timothy Spall. It's 1930s Britain and the nation's sovereignty is faced with a leadership crisis. King George V (Michael Gambon) is rapidly ageing and looking for the true heir to his throne. Neither of his children seem adequate candidates. His eldest son Edward VIII (Guy Pearce) is first in line, but is far too frivolous and is looking to take up with an American woman who has already been divorced and remarried. The king's second son, Albert Frederick Arthur George (Colin Firth), or "Bertie" as his family calls him, seems like a more suitable monarch, but he is entirely lacking in confidence because of a terrible speech impediment. No amount of treatment has been able to cure him of his condition and his wife, Elizabeth Bowes Lyon (Helena Bonham Carter), seeks help from an unlikely source: a lower-class Australian speech therapist, Lionel Logue (Geoffrey Rush). Bertie is initially reluctant because Lionel's unorthodox approach forces him out of his comfort zone. Soon, however, with the rising power of the Nazi party in Germany and need to inspire people's confidence in the British government, Bertie, soon to become the reluctant King George VI, begins to trust Lionel and an unlikely friendship develops. The King's Speech, a thoroughly entertaining slice of history, is just the third feature from John Adams director Tom Hooper. Yet it has still been crafted with a particular amount of delicacy. It's been photographed by cinematographer Danny Cohen with mostly drab colours. The overarching grey skies and dark textures of Bertie's suit are some of the subtle visual devices used to convey Britain's sense of dread and uncertainty at this time. The atmosphere is complimented by the pivotal subtext of David Seidler's intelligent screenplay, specifically the way people are won and lost on what they see and hear. Bertie's father describes how politicians are now nothing but actors because of technological improvements, like the radio and the way that this has, for better or worse, drawn the public closer to the lives of their leaders. It's an idea conveyed most extensively through the progressive friendship of Bertie and Lionel, allowing the film to succeed as a historical piece and equally as a film about social interaction. The sessions shared between Lionel and Bertie are the most crucial aspect of the narrative and the experience of both these terrific actors make these scenes shine. 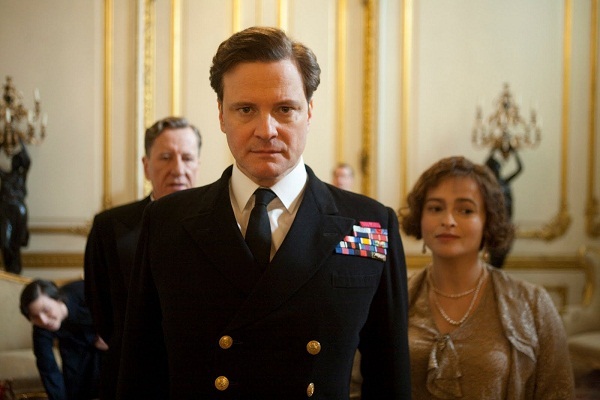 Firth, a current favourite for the Best Actor Oscar, has rarely been better. He has played critically suppressed men before, like his nominated performance in A Single Man, but his performance is distinguished through a number of extraordinary physical constraints. His stammering alone is heartbreaking to watch and listen to. Yet the way Firth struggles internally with his own body, trying to wrench the words out from his lungs, is what makes his work truly powerful. There are more poignant details revealing his isolation from his family and his rivalry with his inept brother too. But his role is enhanced most significantly by his palpable chemistry with Lionel, his opposite. Whereas Firth is appropriately contained, Rush provides a wonderful burst of energy to the film. The script offers him endless opportunities for quiet humour and his comic timing remains impeccable. "You're peculiar," Bertie tells him, to which Lionel replies so finely: "I take that as a compliment." Lionel's charisma and humour is imperative in asserting Bertie's insecurities but also the corridor through which he will draw himself emotionally closer to the common man. There are also some unexpected angles to this friendship too, such as whether Lionel is in some respects trying to influence the monarchy by coaching Bertie. 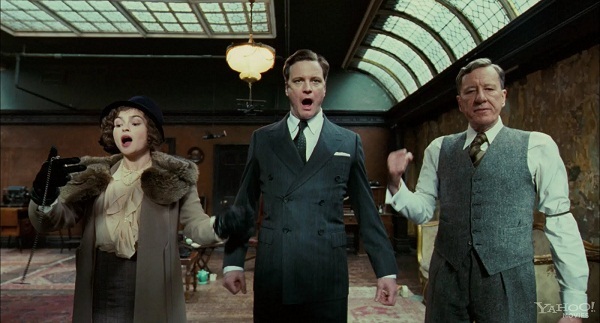 In terms of writing and performances, The King's Speech is an inspired piece of historical cinema.